Telescope, with carrying case, brass / glass / baleen / leather , maker unknown, England, 1850-1855, purchased by William Stanley Jevons from Flavelle Bros & Co, Sydney, Australia. 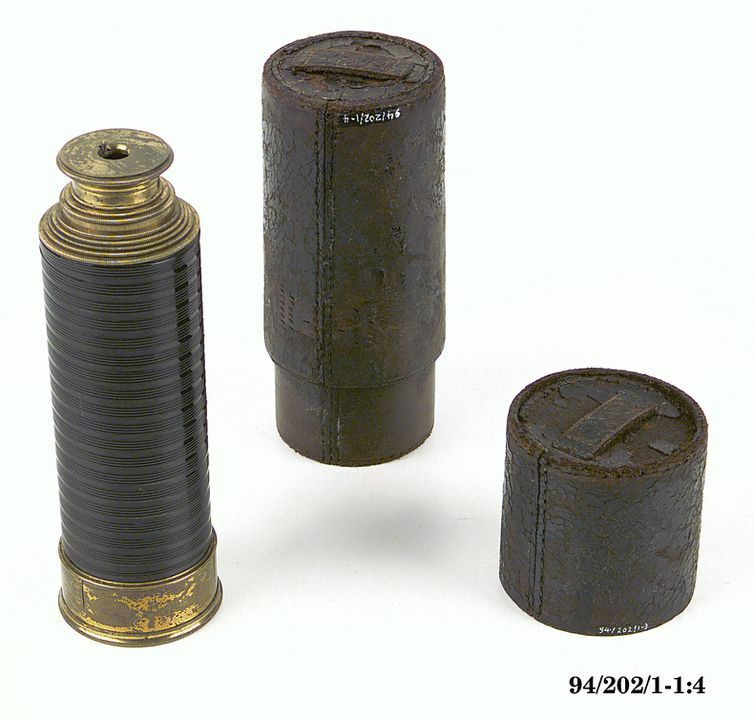 A seven draw brass telescope or spy glass in its original leather carrying case. The outer draw is covered with a shiny black material that is probably baleen. The carrying case bears stitching marks which indicate the original presence of strap, buckle and fastening flap. Telescope, with carrying case, brass / glass / baleen / leather, maker unknown, England, 1850-1855, purchased by William Stanley Jevons from Flavelle Bros & Co, Sydney, Australia. Inscribed "Flavelle Bros. & Co. / Sydney / To adjust by sliding in / the second draw" and "William Edgar Jevons / from / Wm. Stanley Jevons / Jany. 1862"
The telescope was probably designed and made in England, as telescopes were not made in Australia in the mid 19th century. Baleen is a natural polymer composed of keratin. It was harvested from baleen whales and cut and shaped, after softening in hot water, into corset and boot stays and umbrella ribs as well as tough, decorative coatings for items such as telescopes. The hot water treatment temporarily softened the material, but when it cooled it was harder than in its natural state. Probably used by William Stanley Jevons for scientific and perhaps recreational purposes during his time in Sydney and while travelling in the colony. William Stanley Jevons, one of the world's leading economists, worked at the Sydney Mint from 1855 to 1859. Probably sent to John Flavelle in Sydney by Henry Flavelle in London about 1856, and purchased from Flavelle Bros & Co. in Sydney by William Stanley Jevons between 1856 and 1859, when he left the colony. Presented by him to William Edgar Jevons, another family member, in 1862. Purchased by the vendor Charles Vivian in England. Flavelle Bros was formed by John and Henry Flavelle in 1850, with John based in Sydney and Henry in London. By 1856 the company had become Flavelle Bros & Co, the name inscribed on the telescope. William Stanley Jevons came to New South Wales in 1855 to work as an assayer at the new Sydney Mint, and left to return to England in 1859. This object is currently on display in Store 4 at the Museums Discovery Centre.